For this episode, we’re reading Marvel’s comic about all their street-level heroes teaming up, The Defenders! … wait…no, Marvel Knights! It’s like the Defenders TV show except all the characters are different. Well that’s not totally true, Daredevil is there. And The Punisher fights a weird giant spider-person. Just listen to the episode, it’ll all make sense. Chris, Kia, and Vince are happy to announce the launch of “Some of My Friends Read Comics”, the newest show to the All My Friends Are Right Here Network. Search for “Some of My Friends Read Comics” on iTunes or your favorite podcast service! In our first episode, we take a look at Daredevil: Born Again from Frank Miller and David Mazzucchelli. Big bad nurses, stabby Santas, and bowling balls to the head. It’s all right here in Born Again. 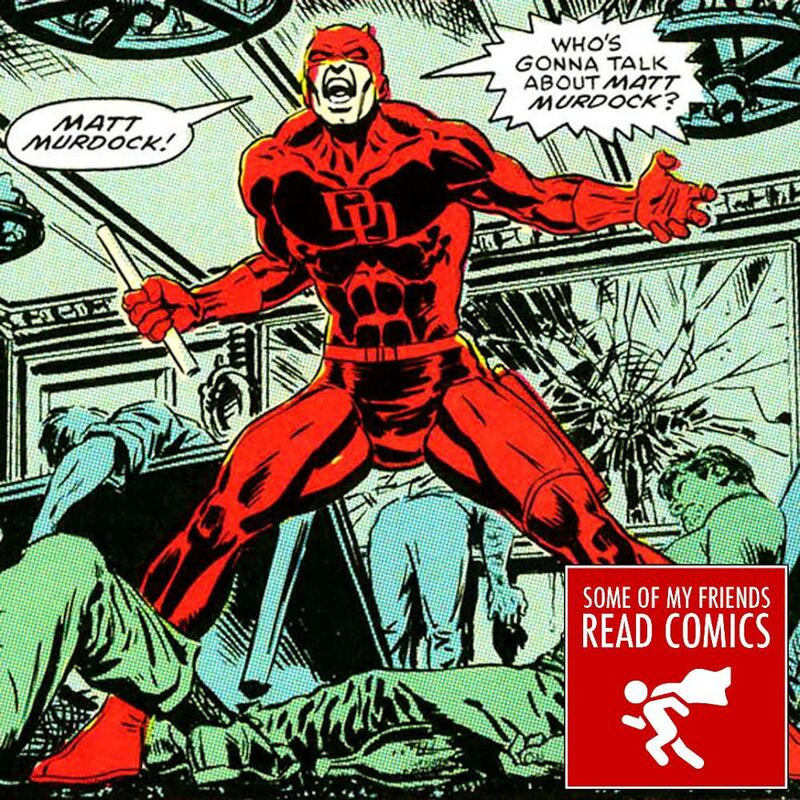 We follow Matt Murdock as he gets more paranoid than we’ve ever seen him before and falls into a deep pit of depression. But hey, can you blame the guy? You’d be a wreck too if the Kingpin discovered your secret identity and dismantled your entire life. Chris, Vince, and Kia go through this story and discuss classic villain tropes, comparisons to Batman, and decide once and for all whether it really deserves to be called a classic. All without giving away any spoilers for the new Netflix series, we promise! If you want to read it for yourself, you can grab a digital version of this 7-issue story for $4.99 at Comixology, read it with your Marvel Unlimited subscription, or just grab it from Amazon.